Using an innovative technique, the event is being captured and turned into a 3D online display, allowing anyone to visit at any time, even after the actual event is over. Brooklyn, NY, May 14, 2010 /PN/ The New York Photo Festival (NYPH), the first international photo festival in the United States, is among the first organizations to employ an exciting new method to bring their event to the entire world. The festival, which showcases the future of contemporary photography, gets underway May 12th in the DUMBO (“Down Under the Manhattan Bridge Overpass”) section of Brooklyn. But for the second time it will also be captured and rendered as a 3D online world, available to virtual visitors anywhere and at any time via the Web. The 3D “coverage” is being executed by DUMBO resident Martin Lenclos. Lenclos creates 3D online experiences of actual events, through the interplay of photos and video interviews, all set in an evocative 3D representation of the event’s environment. Soon after an event begins, a virtual version is launched, which those interested can then visit and explore, both contemporaneous with those attending the event live, or at any point thereafter. The rendered 3D world immerses visitors in the environment of the event, and vastly expands the number of people who can experience it. In association with BOX Creative LLC, a New York-based design firm, Lenclos has been developing the Flash-based application since 2008. Lenclos calls this 3D coverage “a new journalistic and artistic model for the representation of events, designed for proliferation throughout the web." Like YouTube videos, the completed multimedia piece can be embedded in Websites and blogs, greatly expanding the potential exposure. Event organizers provide partners and interested media with a simple embed code for easy sharing. But the 3D coverage is not only a powerful artistic and photographic experience. It also represents a contemporary response to the search for profitable new methods of communication. The display allows for contextual product placement and sponsorship within the 3D Website environment. With a limitless number of potential visitors, sponsors can effectively reach and influence large targeted audiences, improving the organizer’s bottom line before, during and after the event. The event lives on online, reaching customers and influencing their decisions long after the event has closed. 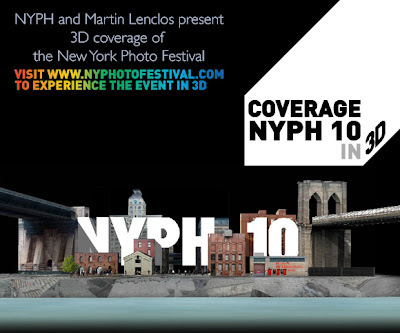 Regarding this year’s NYPH festival, Lenclos says that "by the end of the week, I am planning to have built a complex site with more than 1,000 images and over three hours of video interviews, featuring dozens of attendees and image galleries." NYPH festival founder Daniel Power, the Lucie award-winning publisher of powerHouse books, first commissioned Lenclos to provide 3D event coverage. Success led to further 3D projects for Martin, including the International Photo Festival Paraty Em' Foco in Brazil, and the Warm Up party series for the PS1 Contemporary Art Center in New York, an affiliate of the acclaimed Museum of Modern of Art.